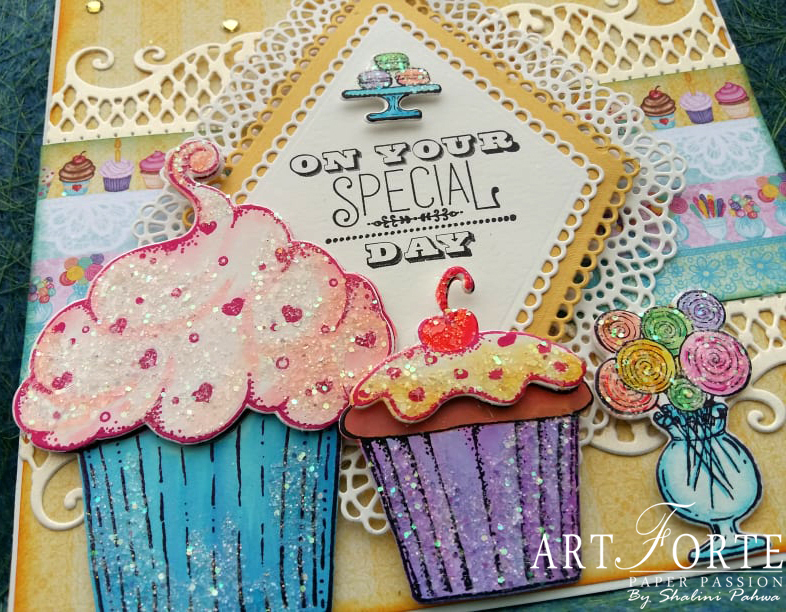 Today we are bringing you a fun surprise -debuting the new 8x8 Insta-Album and Elegant Pocket Dies. These just became available today for everyone! 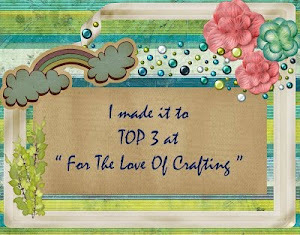 For tips on creating with the Mini Album and Pocket dies, watch the tutorial at https://youtu.be/72AzbXtt2jU. Instructions: To see more of this album, click here. Create album cover with chipboard measuring 4.75 x 6.5"(2) album cover front and back) spine 3". Combine these three chipboard covering with Floral Fashionista Pattern Paper both front and back sides. For Cover, cut one base Regal Frame Die on white cardstock and one on pattern paper and attach this pattern paper on the base of regal frame die. 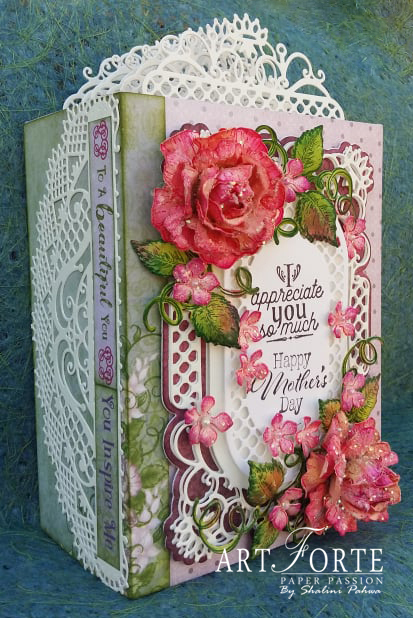 Cut two intricate regal frame die on white cardstock and adhere it on the base of the regal frame die with foam tape to give some dimension. Cut another regal frame die as seen on the picture and stamp sentiment from Thank You sentiment cling stamp set with archival ink-jet black and adhere this die with foam tape . Stamp few flowers from Classic Rose Cling Stamp Set with archival ink-vibrant fuchsia and leaves with library green and cut them with coordinating die and color them using archival ink-vibrant fuchsia and tea rose and leaf green for leaves and shape them using 3D Rose Shaping Mold and using Groove Golf Tool Set also. Create two roses. Sprinkle crystal clear glitter using Designer Dries Clear Adhesive. Stamp some flowers from Floral Fashionista cling stamp set with archival ink-cactus flower and cut them with coordinating die and color them with archival ink rose madder and cactus flower and shape them with Petite Florals 3D Shaping Mold and then add stamen at the centre and sprinkle crystal clear glitter. 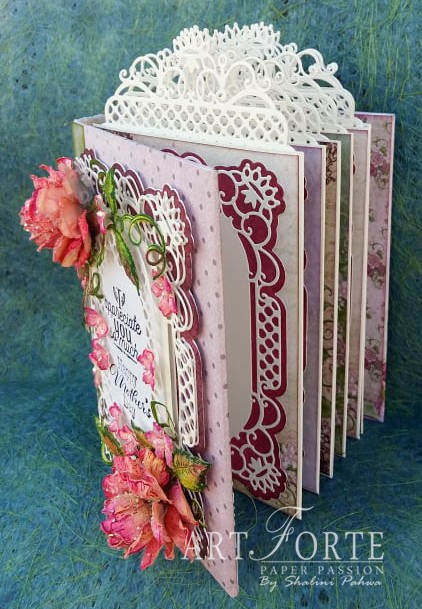 Cut one Adorn It Pocket Accents die on white cardstock and adhere it on spine and add sentiment from floral fashionista pattern paper as seen on picture. 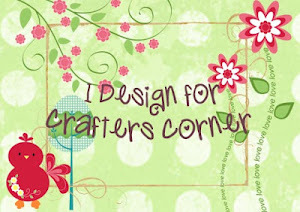 Create hinges measuring 1.5 x 6.125" scoring at half inches(make three of these on white cardstock). For pages create six pockets measuring 4.5 x 6.25". (final size for pages) Attach these pages on these hinges. And create six pocket leaf using Regal pocket Accents Die on white cardstock as seen on picture. 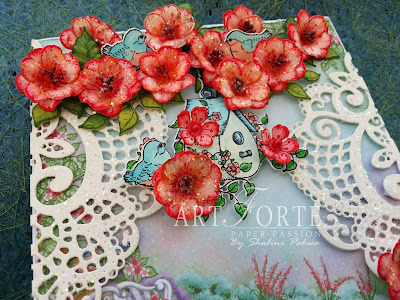 Instructions: Cut one Eyelet lace Frames die on white cardstock and adhere it on white cardstock size 4" x 6" as pictured using Designer Dries Clear Adhesive. 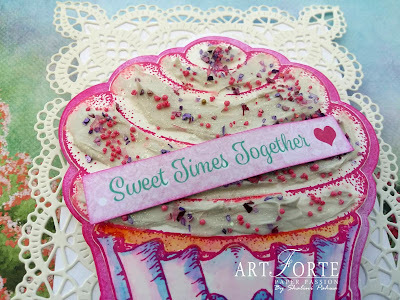 Create a cupcake shaped card and adhere it with foam tape. With the cupcake shaped die cut one pattern paper and distress the edges with archival ink-Vibrant Fuchsia and adhere it on the shaped card. 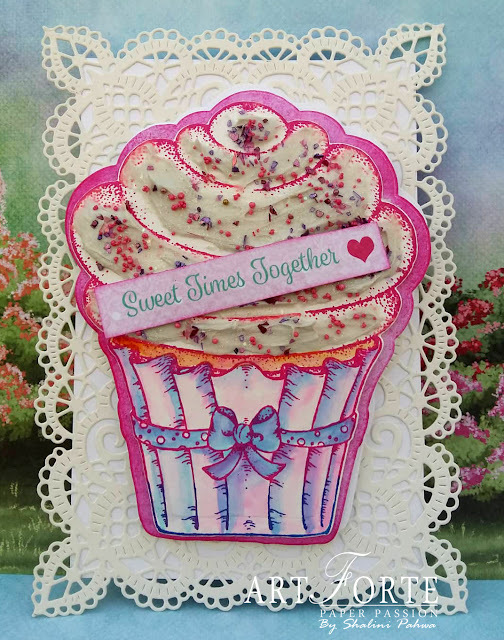 Now stamp one Cupcake from Sugarspun Cupcake Cling stamp set with archival ink-Vibrant Fuchsia, cut it with coordinating die and color it with Zig Clean Color Real Brush Marker on the cover of the cupcake. Decorate the icing using texture paste and sprinkle prills, crystal clear glitter and mauve gala glitz. 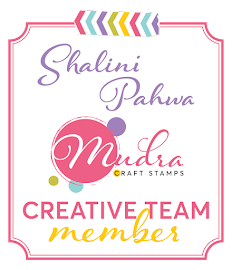 Labels: Heartfelt Creations-Sugarspun Collection, Shalini Pahwa. 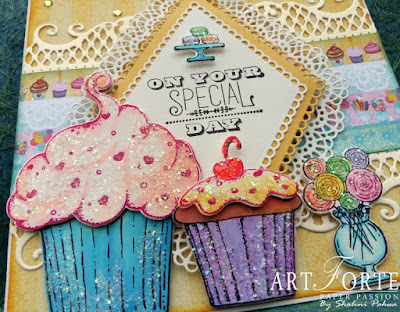 Today's the day the Sugarspun Collection becomes available to everyone! Tantalizing treats showcased in beautifully decorated display windows draw you to the Sweet Shoppe storefront, beckoning you to step inside! Welcomed by the aroma of sweet baked goodies and sugar-laden confections, in no time at all, the mouthwatering scents of vanilla and almond have you convinced to browse and pick out an irresistible delight...after all, you deserve it! It's time to treat yourself and indulge in the newest and sweetest Sugarspun Collection! by Heartfelt Creations. Other Products: White cardstock, Big-Shot Machine, Sequins. Instructions: Card base final size is 6" x 6". Cut pattern paper from the collection at 5.875" x 5.875", distress the edges and adhere to card base. Take another pattern paper from the collection measuring 5.875" x 2.125" and distress the edges and adhere it on the center of the card as shown. Cut two Petite Pocket Accents Die on white cardstock and adhere them on the top and bottom edges of the center panel. 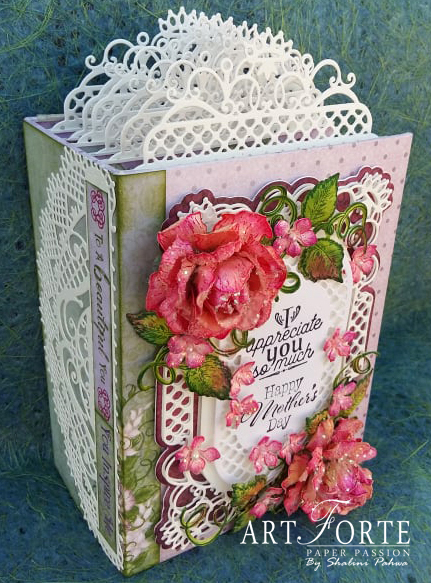 Cut One Lacy Diamond Die on white cardstock and adhere it with foam tape. Cut one Eyelet Diamond Die on golden cardstock and adhere it with foam tape. Take another Eyelet Diamond Die which is smaller than the golden Eyelet Diamond Die and add sentiment from Special Birthday Sentiments Cling Stamp using archival ink-jet black. Adhere this sentiment with foam tape at the centre of the golden Eyelet Diamond Die as seen on the picture. Stamp two cupcakes from Sprinkled Confetti Cupcakes Cling Stamp Set using archival ink-jet black and vibrant fuchsia and cut it with coordinating die and color them with Zig Clean Color Real Brush Markers and sprinkle some crystal clear glitter and adhere them with foam tape. 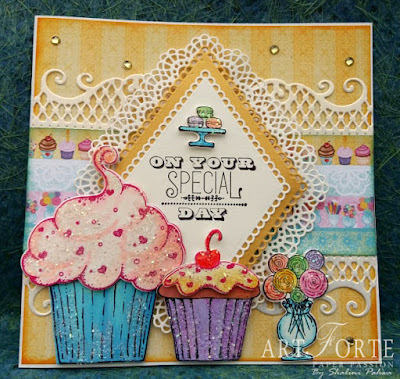 Stamp two image from Sweet Shoppe Treats using archival ink-jet black and cut it with coordinating Die and color it Zig Clean Color Real Brush Markers and sprinkle crystal clear glitter and adhere them with foam tape as shown. 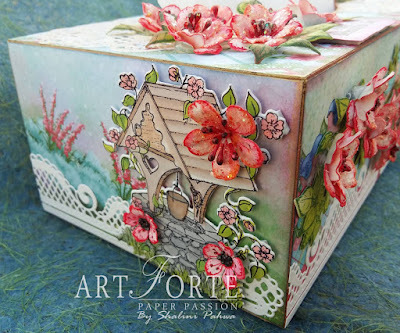 Another inspiration for Heartfelt Creations with Cherry Blossom Retreat Collection. Instructions: Take MDF tissue box and cover it with Cherry Blossom Retreat Pattern Paper and distress the edges. Cut two large intricate die from Daydreams Bridge on white cardstock and adhere on the top of the tissue box as pictured, and then distress with archival ink-carnation red and nuvo embellishment mousse-indian gold. Cut two Decorative Pocket Accents Die on white cardstock and adhere on the front of the tissue box as shown. Stamp some leafy branches from Cherry Blossom Retreat with archival ink-library green, cut them with coordinating die and color them with leaf green and arrange them as pictured. Now stamp some Tweet Cherry Blossoms flower and leaves with archival ink-carnation red and library green, cut them with coordinating die, color them with archival ink-carnation red and leaf green, and shape them with 3D mold. Assemble them as shown and add stamens (add black color at the edge of the stamens), prills and crystal clear glitter. 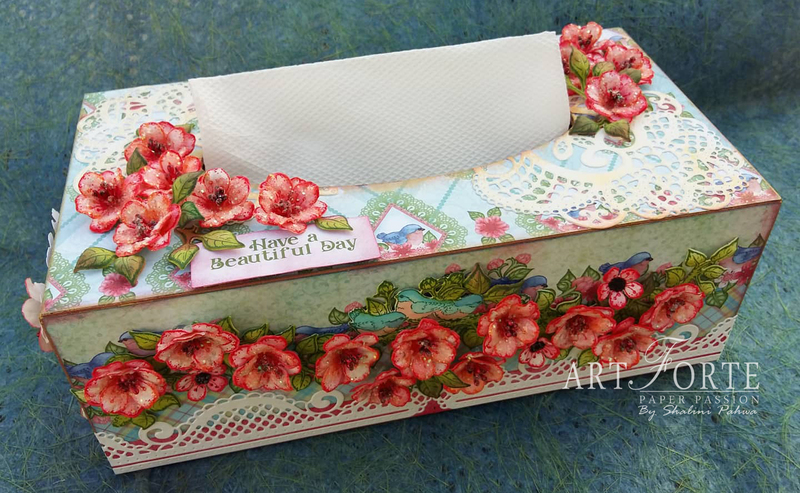 Assemble these flowers and leaves on the top and front of the tissue box. Next, stamp wishing well image from Wishing Well Oasis stamp set with archival ink-jet black, cut it with coordinating die and color it with Zig Clean Color Real Brush Markers. Adhere t at the left side of the tissue box and adhere a few cherry blossom flowers as pictured. 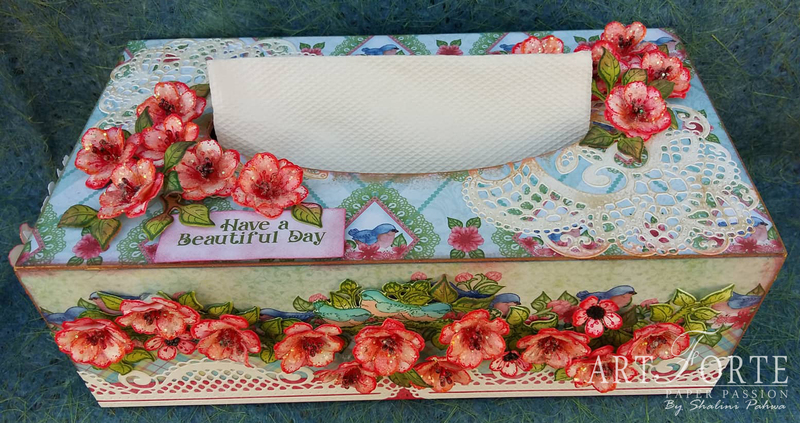 Cut one Decorative Pocket Accents Die on white cardstock and adhere it using Designer Dries Clear Adhesive. 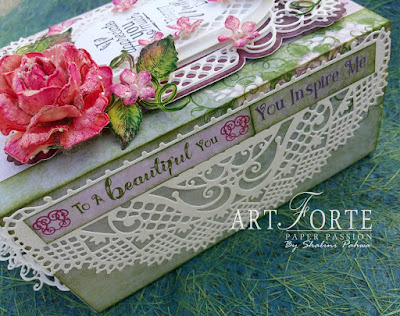 Add sentiment from the collection and adhere it with foam tape. Labels: Heartfelt Creations-Cherry Blossom Retreat Collection, Shalini Pahwa. Happy Wednesday, how's it going? 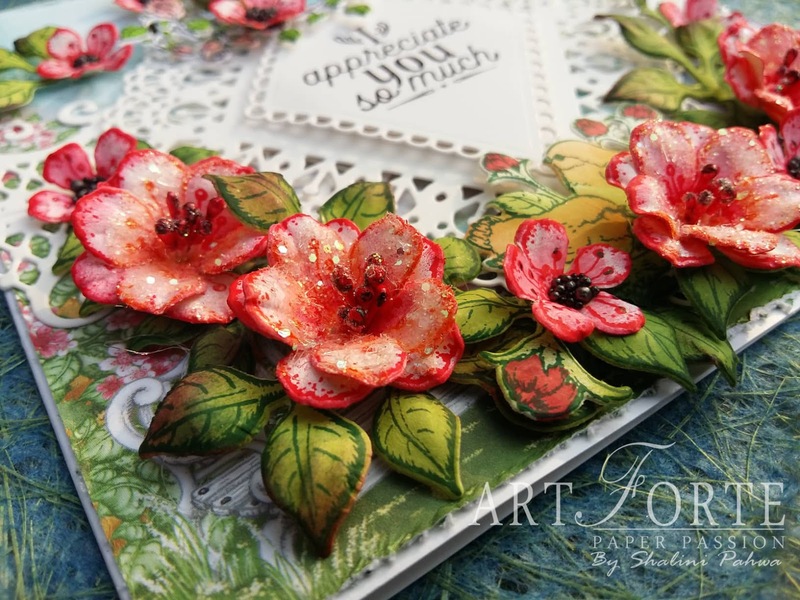 Have you wondered what cardstock is needed to create elegant, deluxe flowers every single time? It's here!!!!! 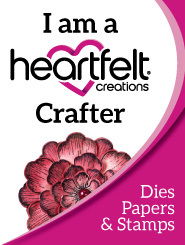 NEW: Deluxe Flower Shaping Paper, by Heartfelt Creations making flower shaping fun and stress free. Coloring and shaping beautiful florals is quick and EZ. Designed to work with the 3D Flower Shaping Molds; the Deluxe Flower Shaping Paper retains beautiful vibrant color application even after heavy water misting and shaping. Instructions: Card size 6"x 6". 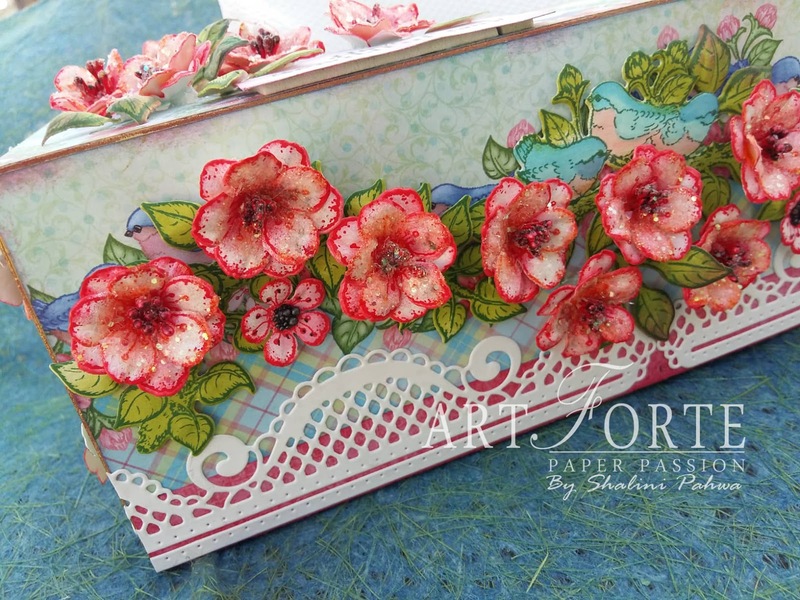 Take pattern paper from the collection and cut to size 5.875" x 5.875"and tear the edges. Adhere on the card base. 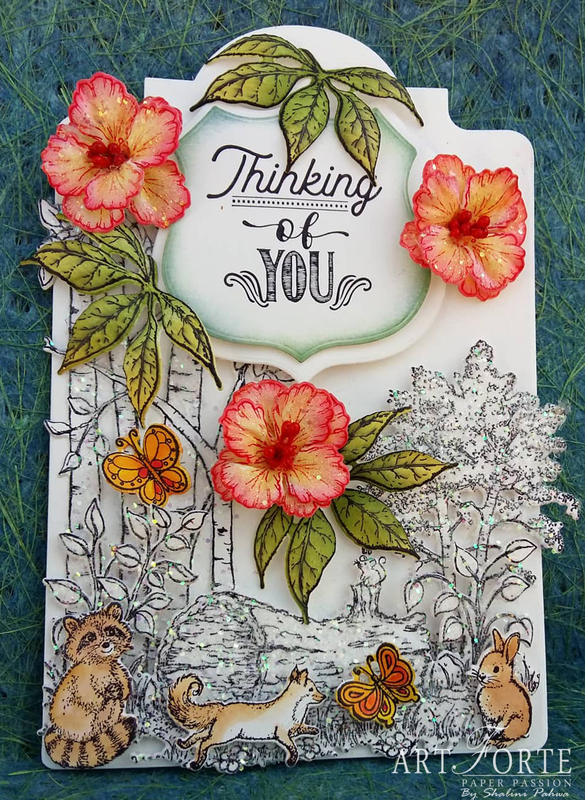 Cut one large intricate die from Daydreams Bridge Die set on white cardstock and cut it in half. Adhere it with foam tape as shown. Sprinkle Crystal Clear glitter using Designer Dries Clear Adhesive. 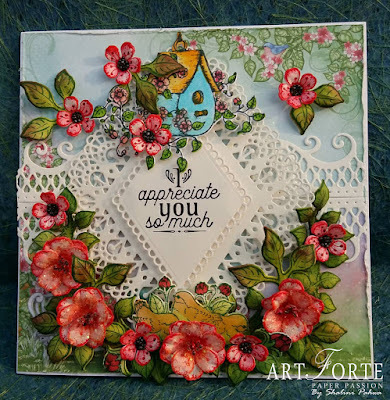 Stamp one birdhouse image from Cherry Blossom Retreat and 3 birds from Tweet Cherry Blossom Images with Archival Jet Black and die cut with coordinating dies. Color with Zig Clean Color Real Brush Markers and Color in watercolor brush-fine. Stamp some Tweet Cherry Blossoms flowers with Archival Carnation Red and Library Green and die cut with coordinating die and color them with Archival Carnation Red and Leaf Green ink. Shape them with 3D mold and assemble them as shown. 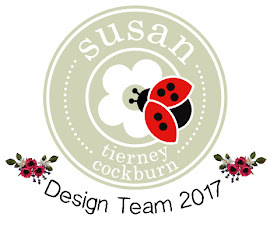 Pierce the center and add stamens (add black color at the edge of the stamens). Apply Dries Clear Glue to the flowers and add Rajni Chawla's Crystal Clear glitter. Add sentiment taken from the Paper collection using foam tape. 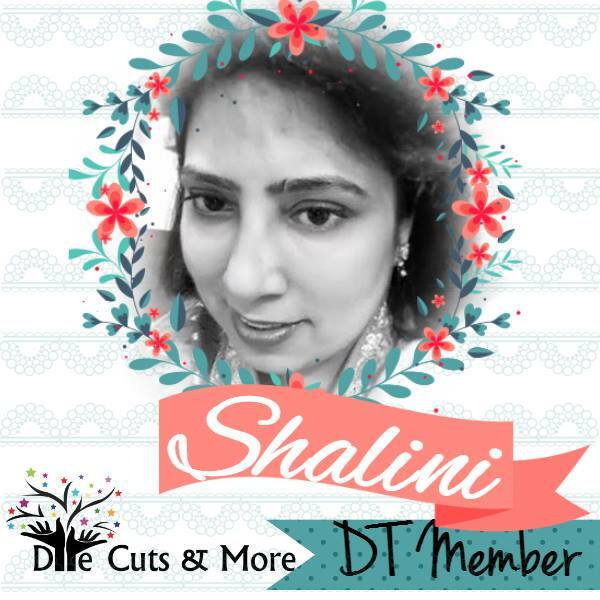 Labels: Heartfelt Creations-Debuting Deluxe Flower Shaping Paper, Shalini Pahwa. 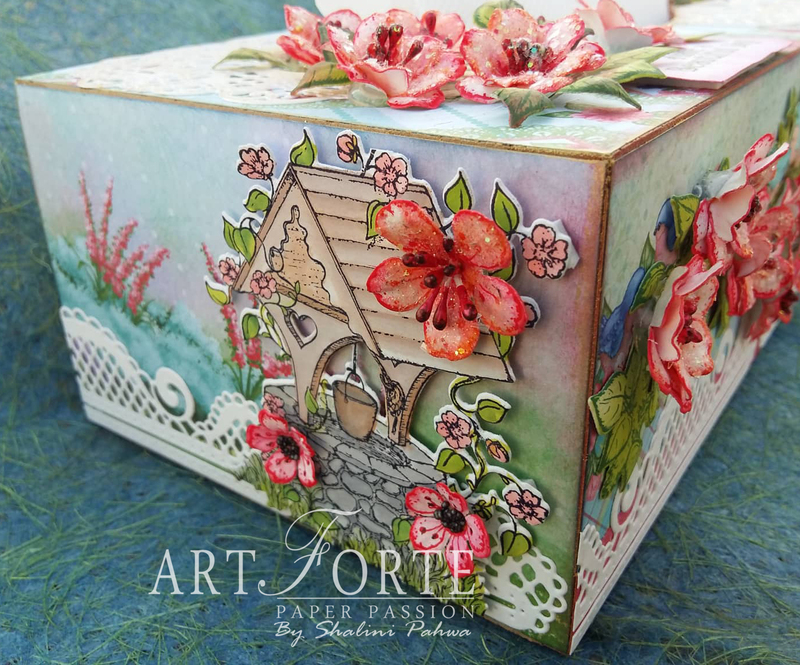 Breathing deeply and enjoying the sweetness in the air becomes second nature, as you take in your enchanting surroundings...taking time to smell the delicate cherry blossoms with the new Cherry Blossom Retreat Collection by Heartfelt Creations!!! Other Products: White cardstock, Big-Shot Machine, Black Pigma Brush Archival Ink Pen. Instructions: Card size 6"x6". Take pattern paper from the collection and cut to size 5.875" x 5.875"and tear the edges. Adhere it to the card base. Cut two Petite Pocket Accents Die from white cardstock and adhere at the centre of the card as shown using Designer Dries Clear Adhesive. 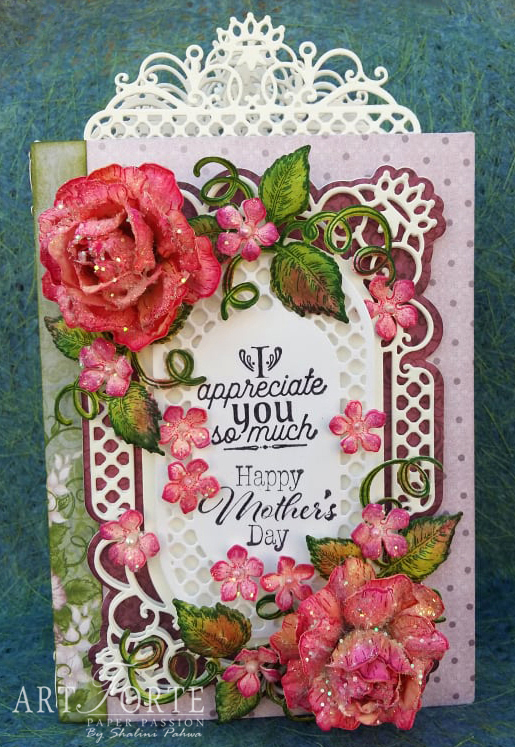 Cut one Lacy Diamond Die on white cardstock and adhere it to the centre of the card with foam tape. 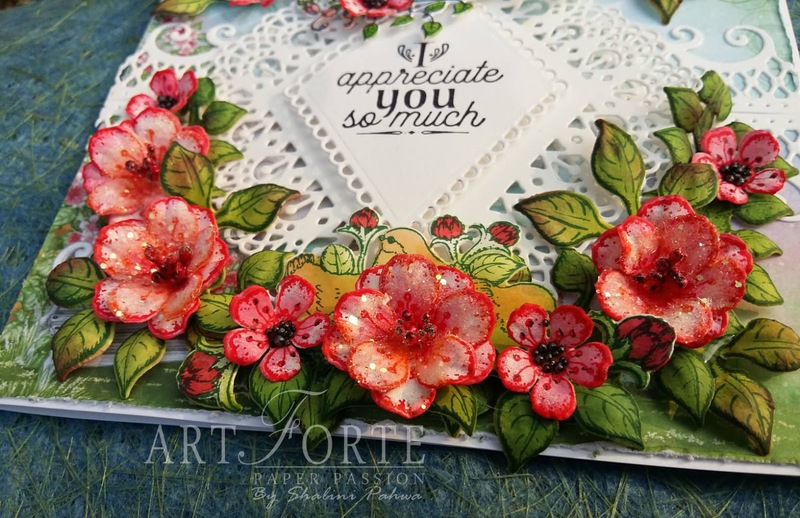 Cut one Eyelet Diamond Die on white cardstock and add sentiment from Thank You Sentiments Cling Stamp Set using archival ink-jet black and adhere it to the centre of the Lacy Diamond Die as shown, using foam tape. Stamp some leafy branches from Cherry Blossom Retreat with archival ink-library green and cut them with coordinating die and color them with leaf green and arrange them as shown. 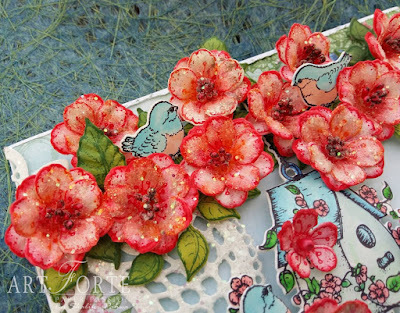 Now stamp some Tweet Cherry Blossoms flowers and leaves with archival ink-carnation red and library green, cut them with coordinating die and color them with archival ink-carnation red and leaf green. 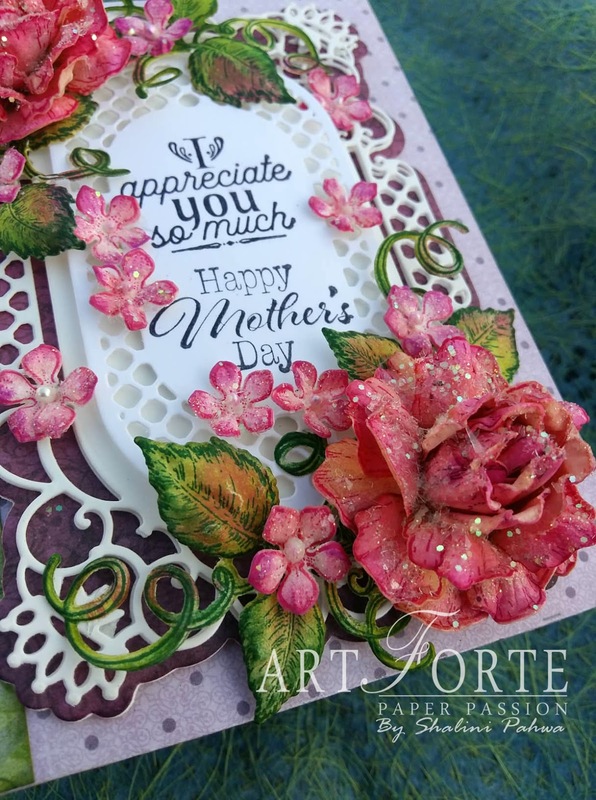 Shape them with 3D mold, assemble them as shown and add stamens (add black color at the edge of the stamens) , prills and crystal clear glitter. 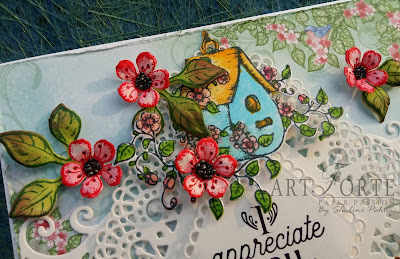 Next, stamp bird house image with archival ink-jet black and cut it with coordinating die and color it with Zig Clean Color Real Brush Markers. 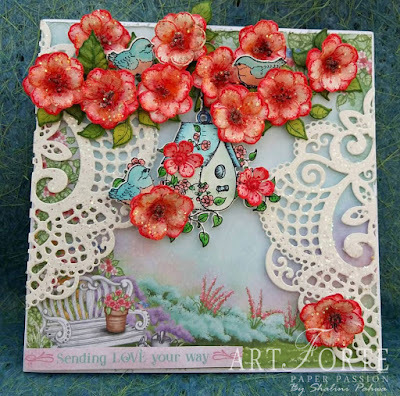 Adhere it at the centre of the card at the top and adhere a few cherry blossom flowers.